Remember that dumpling scene in Crazy Rich Asians? 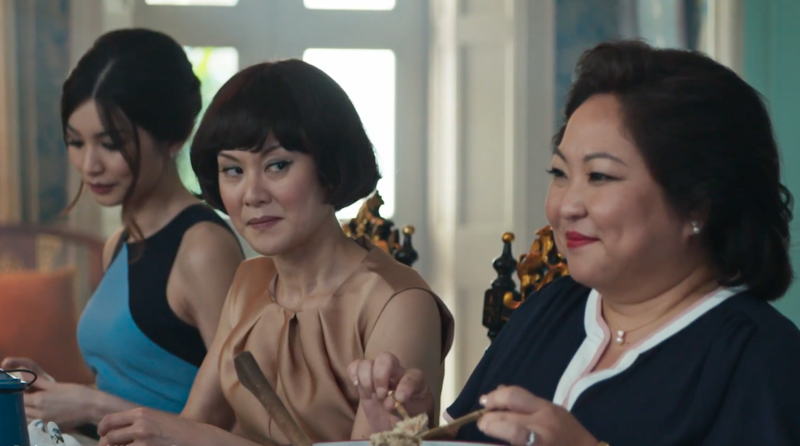 Rachel Chu (played by Constance Wu) is invited to a family gathering at Ah Ma’s house. While the family members sit around the long marble table in an assembly line, filling and perfecting their dumpling folds, Nick’s mother, Eleanor Young (played by Michelle Yeoh) uses the opportunity to passive-aggressively tell her that she isn’t worthy. We’re not encouraging this behaviour of course—but the notion of a family-only dumpling wrapping session now feels like it should be a staple in every notable Singaporean family. And if you didn’t inherit a family dumpling recipe from Ah Ma, don’t worry, the grande dame of Singapore cooking Violet Oon has got you covered. When we attended Betty Chen’s Crazy Rich Asian-themed brunch at the new Violet Oon Singapore outpost at Ion Orchard recently, her chef Paul Chia shared how wor tip dumplings are made from scratch. “You pinch it from the right side of the skin to make it fold. Press, push forward and continue with the next fold,” instructs Paul Chia. Now start practicing. 2. Put 1 tablespoon onto the centre of the dumpling skin and brush egg wash on the corners. Fold into two, and then pinch into 14 folds. 4. Heat a non-stick frying pan. Pour the oil on the pan and fry until browned for two minutes on one side. (If you’d like, you can turn over nad fry the other side till golden). Do not stir when frying. 5. Serve with julienne of young ginger in Chinese black vinegar.